On Saturday 13th June, after 2 long evenings of baking and decorating, Lodge Brothers Funeral Arranger Judy Hyde set up her stall at RAF Northolt to sell her tasty wares to everyone that came to the Centenary Celebrations. In no time at all, she sold everything! 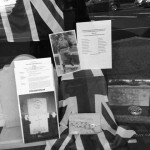 Judy explained “At Lodge Brothers we’re only too happy to be able to support our local servicemen. I’m thrilled that I managed to raise nearly £200 for the RAF Benevolent Fund.